Hi, I am your go-to guy if you want to get things done in Vietnam. I prepare you to work with factories and introduce you to them. May I help you navigate sublimation printing options in Vietnam? 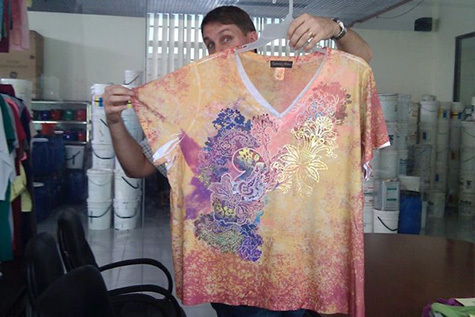 Dye Sublimation in Vietnam on garments is an alternative to screen-printing. You create an image on your computer and print it onto special transfer paper using sublimation inks. Then place the transfer paper and synthetic fabric into a heat press. The heat-press presses the transfer paper against the fabric at 230 degrees Celsius and causes the sublimation inks to “transfer” from the paper to the synthetic fibers i.e. polyester or nylon. After about a minute, the heat is removed and the transfer paper is peeled off, leaving behind a permanent, full color image on the fabric. So, in summary, there are two steps to sublimation printing: step 1 is using digital printer to print your artwork on transfer paper, step 2 is to “heat press transfer” the design from transfer paper to fabric. Most companies doing dye sublimation in Vietnam use this method. There are two companies in Vietnam who use offset printing to print on transfer as opposed to using digital printers. Using the offset printing method requires the use of aluminums rollers that lead to high set up costs. Hence the offset printing method is only economical for high volume production; for example 10,000 pieces per design. To better understand how sublimation works its necessary to first become familiar with the key terms associated with the process. Sublimation is the change of a solid particle directly into a gaseous state. The sublimation inks are heated rapidly such that they instantly expand into a gas state and easily penetrate the fibers of the yarn. This is why the dye sublimation in Vietnam has good color fastness properties. A dye is a substance used to color materials and fibers. To dye is to impregnate color into a material. Often, this color change is permanent. In comparison, pigment inks, such as those used in screen-printing, are applied to the surface of a fabric. A polymer is a chemical compound made of small and identical molecules (called monomers) linked together. To sublimate print on hard surfaces you need a special polymer coating that “opens” to accept colored dyes when heated to 230 Degrees Celsius and then “closes” to trap the dyes when cooled. Some polymers, such as cellulose, occur naturally, while others, such as nylon, are man-made. To sublimate print on cotton or other natural fibers you need to apply a polymer first. Substrate is a term used to describe the base material onto which images are printed. Typical substrates include fabrics, plastics, metal, films and foils. This factory specializes in dye sublimation printing in Vietnam. I visited them today and saw their screen printing operation as well as their foil print capabilities and sublimation samples. They are also doing burnout which looks really great with printing on top. Reason is that they know who is doing what kind of sublimation in Vietnam. In fact dye sub in Viet Nam is behind China and Thailand hence there aren't many good options here. The quality of dye sub is improving each year and Thai Son S.P merchandising team is constantly updating their supplier list. ASV has works closely with Thai Son apparel factory in Vietnam. They are a Oeko Tex certified garment factory in Vietnam. Thai Son is highly specialized in producing fashionable garments from knit fabric that have difficult embellishments like stones, appliqué and embroidery. Thai Son is proud to proud to be one of the family-owned garment supplies who have been surviving and developing for the past 22 years. 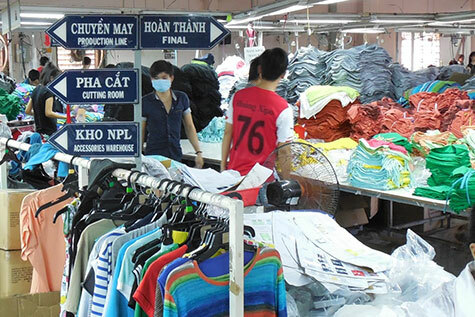 Currently, Thai Son has two production facilities in Ho Chi Minh City and has 20+ sewing lines combined. Thai Son has been producing knit wear garments for export customers for more than 22 years and knows how to take care of their customers to get repeat orders. If you are looking for Dye Sublimation in Vietnam and a Oeko Tex Certified Garment Factory in Vietnam then contact Thai Son via their website. Thai Son does not do dye sublimation in Vietnam. They outsource it depending on the kind of sublimation you need. Thai Son knows who does dye sublimation in Vietnam which gives them flexibility depending on your needs. They can source polyester fabric using ringspun DTY or rotorspun FDY poly yarn. They can get you the hand feel you need and quality of dye sublimation you require. Are you sourcing dye sublimation in Vietnam? If yes, then contact us below to learn more about the state of sublimation printing in Vietnam.